Blog Johnston Atoll Base Beautification Plan - My Most Bizarre Planning Project...ever! In the late 1980’s when I was working for Helber, Hastert, Van Horn and Kimura in Honolulu we undertook the most bizarre project of my career. At the time, the office did a lot of military planning work for the U.S. Navy. I wasn’t involved in very much of it as I specialized in tourism, resort and residential projects. However, the office was given a project by the Navy, for which they needed a “design” planner and I was the one given the job. 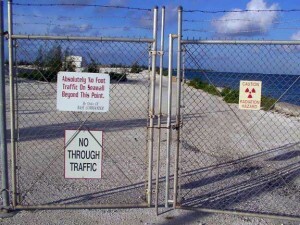 Johnston Atoll – Where and What and How Toxic? The project was a facilities master plan and a base beautification plan for Johnston Atoll in the South Pacific. Johnston Atoll is an atoll located approximately 700 miles south of Hawaii. It is approximately 2 1/2 miles long and 1/2 a mile wide. As an atoll, it is formed entirely out of coral. In this particular case, at this particular time, the base located there was run by an agency called the Defense Nuclear Agency. It is now known as the Defense Special Weapons Agency. It is part of the Defense Department. So, during the 1960’s, Johnston Atoll was used by the Defense Department for the testing of nuclear weapons and delivery systems. Thus, they used the place to shoot off rockets containing nuclear weapons. So, one or two of them failed and part of the island is contaminated with radioactive plutonium. During the Vietnam war, the government stored excess Agent Orange and many of the canisters or barrels leaked Agent Orange into the ground. So, another part of the atoll is contaminated with Agent Orange defoliant. Finally at the time, the Department of Defense was storing leftover nerve gas that had been manufactured for the Vietnam war. When the war ended, much of the leftover nerve gas was moved to and stored at Johnston Atoll. So, we boarded an Aloha Airlines plane and flew to Johnston Atoll from Honolulu. You could only get off the plane there if you were on official business. So, we arrived and deplaned. We were met by some people and taken immediately to a briefing room. Once there, they explained to us about the conditions on the Atoll, including the plutonium, Agent Orange and nerve gas. We were then issued three sets of hypodermic needles and a gas mask! Forget the usual topographic maps and background studies. We were being outfitted for chemical warfare! The hypodermic needles contained the antidote for the nerve gas in case there was some sort of leak while we were there. We were told we had to carry them and the gas mask with us where ever we went! And I was supposed to be doing a base beautification plan? This was without a doubt the most bizarre assignment/project I had ever encountered. Each of the first three morning there, we had to get up at 6:00 am and go straight the the infirmary to have blood drawn, so that in the event of an accident, they would have a “medical baseline” for each of us to compare the affects of the nerve gas on our bodies to. So, as we would find out, the base consisted of a runway long enough to land a Navy cargo plane or a Boeing 747, the cordoned off areas where the plutonium, nerve gas bunkers and Agent Orange spills were located. Then about a third of the island was the actual area developed as housing and other related facilities. At the time we were there, there were about 50 employees of the Defense Nuclear Agency stationed there. Their mission was to keep the base functional in case the United States ever went back to atmospheric testing of nuclear weapons. Something which not one person said would ever happen. In addition to official staff, there were approximately 1,000 contract workers there in support of the official staff. They included chefs, kitchen help, bartenders, maids, gardeners, PX workers and so on. They would stay on the atoll for 48 weeks a year and then get a months vacation. There were also about 100 army personnel doing whatever it was they were doing. At the time we were there, there were also about 150 construction workers from Hawaiian Dredging who were building a plant to incinerate the stored nerve gas. So, overall there were about 1,300 people stuck on this tiny atoll, seven hundred miles from the nearest civilization! 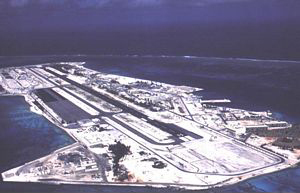 On the atoll were administration buildings; a dining hall; barracks; a couple of bars; an outdoor movie theatre; a nine-hole par 3 golf course with plastic tee mats and oiled greens; a PX (store); a couple of gyms; and recreation facilities like basketball courts, volleyball courts and bicycle rentals. The weather was warm with the wind blowing at approximately 20 miles per hour constantly…which gets very irritating in a very short time! We were there for 8 days and it seemed like 8 months! The one thing that was nice about the place was the dining hall. In order to keep all the “residents” happy they realized they had to feed people well! So, they served us three incredible buffets a day. Every night was a special night, with specials like steak night, crab night, lobster night, prime rib night and so on. I gained 8 pounds in 8 days! To recommend building paint color palates to “beautify” the base. to develop efficient and pleasant looking signage in a complete signage package to make the base function better and “beautify” the base. All of this while my colleagues developed a base facility master plan for the future of the base. The most challenging part of my assignment was landscaping. Because nothing grows very well in coral. For example, one day I met with the chief gardener. He and I got in a golf cart and toured the atoll landscaping. He took me to see his prized plant, which was a three-foot tall hibiscus plant with about 10 leaves. It was one of the most scraggly plants I have ever seen and if it were in your yard, you would pull it up and throw it in the garbage can! The “golf course” had no grass on it. So, during an eight day visit, I managed to prepare a building coloration plan, prepare a base landscape plan (which would never have a chance of happening), and develop a comprehensive signage plan. In addition, I also lost 3 pints of of blood, gained 8 pounds, learned a career worth of information about plutonium poisoning, Agent Orange and nerve gas and got to fly on Lockheed C-5 cargo plane (back to Hawaii) for the first time in my life. This was truly the most bizarre project I have ever experienced in my 30+ year career!